The Curtiss P-36 Hawk, also know as Curtiss Hawk Model 75, was a U.S.-built fighter aircraft of the 1930s. A contemporary of the Hawker Hurricane and Messerschmitt Bf 109, it was one of the first fighters of the new generation -- sleek monoplanes with extensive use of metal in construction and powerful piston engines. Obsolete at the onset of World War II and best known as the predecessor of the Curtiss P-40, the P-36 saw only limited combat with the United States Army Air Forces but was extensively used by the French Air Force and also by British Commonwealth and Chinese air units. With around 1,000 aircraft built, the P-36 was a major commercial success for Curtiss. This article also covers the YP-37 and the XP-42 prototypes based on the P-36. The Curtiss Model 75 was a private venture by the company, designed by former Northrop engineer Donovan Berlin. The first prototype constructed in 1934, featured all-metal construction with fabric-covered control surfaces, Wright XR-1670-5 radial engine developing 900 hp (671 kW), and typical U.S. Army Air Corps armament of one 0.30-cal. and one 0.50-cal. machine guns firing through the propeller arc. Also typical of the time was the total absence of armor or self-sealing fuel tanks. The distinctive landing gear which rotated 90 degrees to fold the main wheels flat into the thin trailing portion of the wing was actually a Boeing-patented design for which Curtiss had to pay royalties. The prototype flew in May 1935, reaching 281 mph (452 km/h) at 10,000 ft (3,050 m) during early test flights. On 27 May 1935, the prototype was flown to Wright Field, Ohio, to compete in the USAAC fly-off for a new single-seat fighter but the contest was delayed because the Seversky entry crashed on the way to the contest. Curtiss took advantage of the delay to replace the unreliable engine with a Wright XR-1820-39 Cyclone producing 950 hp (709 kW) and to rework the fuselage, adding the distinctive scalloped rear windows to improve rear visibility. The new prototype was designated Model 75B with the R-1670 version retroactively designated Model 75D. The fly-off finally took place in April 1936. Unfortunately, the new engine failed to deliver its rated power and the aircraft attained only 285 mph (460 km/h). 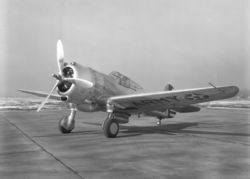 Although its competitor, the Seversky P-35, also underperformed and more expensive, it was declared the winner and awarded a contract for 77 aircraft. Then, on 16 June 1936, Curtiss received an order from USAAC for three prototypes designated Y1P-36. The USAAC was concerned about political turmoil in Europe and about Seversky's ability to deliver P-35s in a reasonable timeframe and therefore wanted a backup fighter. The Y1P-36 (Model 75E) was powered by a Pratt & Whitney R-1830-13 Twin Wasp engine producing 900 hp (671 kW) and further enlarged scalloped rear canopy. The new aircraft performed so well that it won the 1937 USAAC competition with an order for 210 P-36A fighters. In early 1937, the USAAC ordered Curtiss to adapt one P-36 to the new liquid-cooled turbosupercharged Allison V-1710 engine with 1,150 hp (858 kW). Designated XP-37, the aircraft used the original Model 75 airframe. Radiators were mounted on the sides of the fuselage around the engine. To balance the aircraft and make room for the radiators, the cockpit was moved far to the rear. The aircraft flew in April 1937, reaching 340 mph (547 km/h) at 20,000 ft (6,100 m). Although the turbosupercharger was extremely unreliable and visibility from the cockpit on takeoff and landing was virtually nonexistent, the USAAC was sufficiently intrigued by the promised performance to order 13 service test YP-37. Featuring improved aerodynamics and a more reliable turbosupercharger, the aircraft first flew in June 1939. However, the powerplant remained unreliable and the project was cancelled in favor of another Curtiss design, the P-40. In an attempt to improve aerodynamics of the air-cooled piston engines, the fourth production P-36A (serial 38-004) was equipped with a long streamlined cowling resembling that of a liquid-cooled engine. Twelve different designs were tried with little success -- although the aircraft was faster than a regular P-36A, engine cooling problems were never resolved. Since the new P-40 was faster, the project was cancelled. Late in its service life, the sole XP-42 was fitted with an all-moving tailplane and used to study that control configuration. 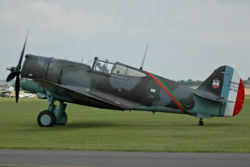 Argentina bought a number of the simplified, fixed landing gear Hawk 75Os, (intended for rough-field operations and ease of maintenance) and purchased a manufacturing license for the type, subsequently building 200 aircraft from 1940. Argentinian Hawks remained in service until 1954. In March 1942, ten USAAC P-36As were transferred to Brazil. The prototype of the Hawk 75H - a simplified version with fixed landing gear, like the 75O - was eventually sold to Chinese Nationalist government who presented it to Claire L. Chennault for personal use. China also received two similar demonstrators, Hawk 75Q. They also used a number of simplified Hawk 75Ms against Japanese. The Hawk 75A-5 was built under license in China, but production was later moved to India, and these machines were absorbed into RAF as Mohawk IV. After the fall of France, Germany agreed to sell captured Curtiss Hawk fighters to Finland in October 1940. In total, 44 captured aircraft were sold to Finland with three deliveries from 23 June 1941 to 5 January 1944. Not all were from the French stocks, but some were initially sold to Norway and captured in their wooden crates when the Germans conquered the country. The aircraft were given serial codes CU-551 to CU-585. In Finnish service, the Hawk was well-liked, affectionately called Sussu (sweetheart). The Finnish Air Force enjoyed success with the type, credited with 190 1/3 kills by 58 pilots, from 1941-44. Finnish ace Kyösti Karhila scored 13 1/4 of his 32 victories in the Hawk, while the top Hawk ace K. Tervo scored 15 3/4 victories. The Hawks were flown by Lentolaivue 32 (later Hävittäjälentolaivue) throughout their wartime operational service. The Finnish Hawks were initially armed with either four or six 7.5 mm machine guns. While sufficient during the early phase of Continuation War, the increasing speeds and armour of Soviet planes soon showed this armament was not powerful enough. From 1942 the State Aircraft Factory replaced the fuselage machine guns with either one or two 12.7 mm Colt machine guns and installed two 7.7 mm Browning machine guns to each wing. The 12.7 mm Berezin UB or LKk/42 heavy machine guns were also used. The installation of heavier armament did not cause changes to the very good flying characteristics of the fighter but the armament was much more powerful against Soviet planes. The Finnish Hawks were also equipped with Revi 3D or C/12D gunsight. Surviving Finnish aircraft remained in service until 1948. While the P-36 had only a brief career at home, the aircraft saw widespread service abroad. Even before the P-36A entered production, the French Air Force entered negotiations with Curtiss about delivery of 300 aircraft. The negotiating process ended up being very drawn-out because the cost of the Curtiss fighters was double that of the French Morane-Saulnier MS.406 and Bloch MB.150, and the delivery schedule was deemed too slow. Since the USAAC was unhappy with the rate of domestic deliveries and believed that export aircraft would slow things down even more, it actively opposed the sale. Eventually, it took direct intervention from U.S. President Franklin Roosevelt to give the French test pilot Michel Detroyat a chance to fly the Y1P-36. Detroyat's enthusiasm, problems with the MB.150, and the pressure of continuing German rearmament finally forced France to purchase 100 aircraft and 173 engines. The first Hawk 75A-1 arrived in France in December 1938 and began entering service in March 1939. After the first few examples, aircraft were delivered in pieces and assembled in France by the Societe Nationale de Constructions Aeronautiques du Centre. Officially designated Curtiss H75-C1, the aircraft were powered by Pratt & Whitney R-1830-SC-G engines with 900 hp (671 kW) and had metric instruments, a seat for French parachutes, a French-style throttle which operated in reverse from US and British aircraft (e.g. full throttle was to the rear rather than to the front) and armament of four 7.5 mm machine guns. The aircraft evolved through several modifications and by the time France fell to German occupation, the air force had 291 Hawk 75As in service. On 8 September 1939, aircraft from Groupe de Chasse II/4 were credited with shooting down two Luftwaffe Messerschmitt Bf 109Es, the first Allied air victory of World War II on the Western front. During 1939-1940, French claimed 230 confirmed and 80 probable victories in Hawk 75s against only 29 aircraft lost in aerial combat. Of the 11 French aces of the early war, seven flew Hawks. The leading ace of the time was Lt. Marin La Meslee with 15 confirmed and five probable victories in the type. H-75-equipped squadrons were evacuated to French North Africa before the Armistice to avoid capture by the Germans. While under the Vichy government, these units clashed with British aircraft over Mers el-Kébir and Dakar. During Operation Torch in North Africa, French H-75s fought against US Navy F4F Wildcats, losing 15 aircraft to seven shot down American planes. From late 1942 on, the Allies started re-equipping French units formerly under Vichy and the H-75s were replaced by P-40s and P-39s. In October 1939, the Netherlands East Indies government ordered 24 Hawk 75A-7, powered by 1200 hp Cyclones. They had 4 x 7.7 mm machine guns (two in the nose and one in each wing) and could carry 2 x 100 pnd bombs. The fighters were shipped in 1940 (and were almost rerouted to the Netherlands, when Germany invaded) and were used extensively leading up to the Japanese attack. However, by that time the planes had flown so many hours, the engines were worn out. These Dutch Hawks formed 1-VlG IV, or Vliegtuiggroep IV, 1e afdeling (1st Squadron, Airgroup IV) of the ML-KNIL and some with 1-VlG V. They saw action over Malakka, Sumatra and Java, successfully bombing a railroad and intercepting bombers. They also participated in the extensive dogfights over Soeabaja, where US, RAF and ML-KNIL aircraft together fought Japanese bombers and fighters. Norway ordered 24 Twin Wasp-powered Hawk 75A-6s, of which 19 were delivered and seven assembled at the time of German invasion. None of the aircraft were combat-ready. The disassembled aircraft were disabled by a single customs employee who smashed the instruments and cut all the wires he could reach. Norwegian Hawks captured by the Germans were part of the batch sent to Finland. Norway also ordered 36 Cyclone-powered Hawk 75A-8s, most (30) of which were delivered to a Norwegian training base (established by the exile-government in London and named "Little Norway") near Toronto, Ontario, Canada, as advanced trainers. Still later, they were resold to the US as the P-36G. Ten Hawk 75A-9s were delivered to Persia, but were captured by the British while still in crates. These were then used by the RAF in India as Mohawk IVs. In 1943 the US sent 28 Hawks to Peru under Lend-Lease agreement. These were ex-Norwegian P-36Gs that had served in Canada. Twelve British Mohawks ended up in Portugal, after they became obsolete in the RAF. A few Hawk 75N were used by Thailand during the French-Thai War, and in the token defence against Japanese forces. Like others, the Royal Air Force also displayed considerable interest in the aircraft. Comparison of a borrowed French Hawk 75A-2 with a Supermarine Spitfire Mk I revealed that Hawk had several advantages over the early variant of the iconic British fighter. The Hawk was found to have lighter controls than the Spitfire at speeds over 300 mph (480 km/h), especially in diving attacks, and was easier to maneuver in a dogfight thanks to the less-sensitive elevator and better all-around visibility. The Hawk was also easier to control on takeoff and landing. Not surprisingly, the Spitfire's superior acceleration and top speed ultimately gave it the advantage of being able to engage and leave combat at will. Although Britain decided not to purchase the aircraft, they soon came in possession of 229 Hawks comprised of diverted shipments to occupied France and aircraft flown by escaping French pilots. The aircraft received the designations Mohawk I through IV, mirroring French Hawk 75A-1 through A-4, and were fitted with 0.303-cal. Vickers K machine guns and conventional throttles (forward to increase power). Obsolete by the standards of the European theatre, 72 Mohawks were sent to South African Air Force, and a number served in India and Burma. In April 1941, the Indian government ordered 48 Cyclone-powered Hawk 75As to be built by Hindustan Aircraft. The first Indian-built machine was test flown on July 31, 1942. Four additional machines were completed before the project was abandoned. The Indian-built machines were absorbed into the RAF as Mohawk IVs. Similarly, Chinese license production of the Hawk 75A-5 was moved to India, and these machines were also absorbed into RAF as Mohawk IV. The first production P-36A were delivered to the 20th Pursuit Group at Barksdale Field in Louisiana in April 1938. The aircraft's service history was marred by numerous teething problems with engine exhaust, skin buckling over landing gear, and weak points in the airframe, severely restricting the performance envelope. By the time these issues were resolved, the P-36 was considered obsolete and was relegated to training units and overseas detachments at Albrook Field in the Canal Zone, Elmendorf Field in Alaska, and Wheeler Field in Hawaii. The only combat with US-operated P-36s took place during the Pearl Harbor attack on 7 December 1941. Four of the 39 aircraft were able to take off during the attack and were credited with shooting down two Japanese Nakajima B5N bombers, first US aerial victories of World War II. Model 75K - Unbuilt version, it was going to be powered by a Pratt & Whitney R-02180 Twin Hornet engine. P-36G - Hawk 75A-8 used by Norway for training in Canada, later to Peru. Wright R-1820-G205A engine with 1,200 hp (895 kW). Hawk 75A-7 - version for Netherlands East Indies: 1200 hp Cyclone, 4 x 7.7 mm (two in nose, one in each wing) and 2 x 100 pnd bombs. Hawk 75A-8 - Export version for Norway. Later redesignated P-36G. Bowers, Peter. Curtiss Aircraft, 1907-1947. Annapolis, Maryland: Naval Institute Press, 1979. ISBN 0-87021-152-8. Swanborough, Gordon and Bowers, Peter. United States Military Aircraft Since 1909. Washington, DC: Smithsonian, 1989. ISBN 0-87474-880-1. This page was last edited on 6 March 2007, at 16:34.